A black and white negative of a funeral wreath created by W.A. Cormack Florist Shop. 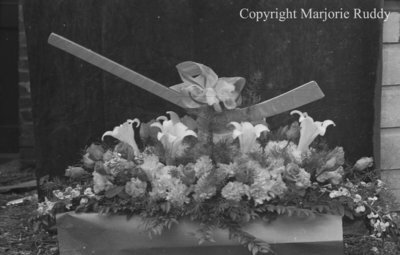 There is a replica of a hockey stick in the centre of the floral arrangement. William Alexander Cormack was born in Whitby, Ontario on 20 September 1904. He married Wilma Marion Hall on 24 May 1952 in Hamilton, Ontario. W.A. Cormack Funeral Wreath, April 6, 1938, Marjorie Ruddy. Whitby Archives A2013_040_976D.